Apple’s new iPad 2 is basically one big screen. So the very first accessory that many of us will look for is a protective case for our new iPad 2s. On launch day I wasn’t aware of any other case options besides Apple’s very own iPad Smart Cover which was available for $39 (polyurethane) or $69 (aniline-dyed Italian leather). 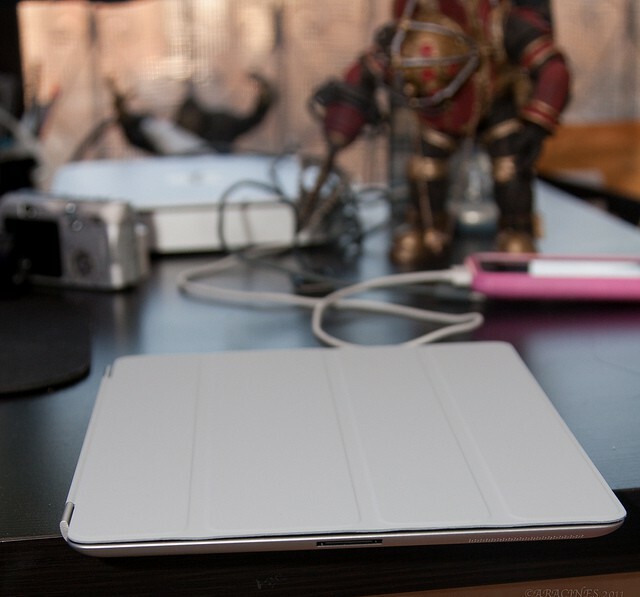 The Smart Cover isn’t even close to being a case since it just protects the iPad 2’s display. The sides and back are completely exposed and unprotected. It’s elegant, thin, and doesn’t add a lot of weight or bulk to the iPad 2. The Smart Cover is very thin and fits the iPad perfectly. It’s so thin it feels like you haven’t really added anything to the iPad at all. Perhaps that is just an illusion after owning the first iPad, but regardless it just doesn’t add a whole lot to the iPad’s weight or thickness. That is how it feels without going crazy weighing it, measuring it, etc. It just feels right. You can get the Smart Cover made of polyurethane in orange, lime, green, pink, light blue, and light gray. The leather version comes in tan, beige, black, red, or navy. I purchased a black leather cover to go with my iPad 2 on launch day. Both versions of the cover feature a material that feels like felt on the side facing and touching the display. The leather model that I tested felt good in my hand and didn’t feel slippery. I was told by a friend who purchased the polyurethane version that it feels a lot like rubber and isn’t slippery feeling in the hand either. The Smart Cover features three vertical ribs and a long magnetized metal bar running down the left hand side of the Smart Cover that had hinges on it. Whenever you bring this metal portion of the Smart Cover close to your iPad 2 it quickly attached itself to the left side of the iPad 2. Once attached it completely covers the entire front side of the iPad 2. Then magnets inside of the Smart Cover and iPad 2 serve to keep the Smart Cover in place and they work fairly well for the most part. There were several times where I thought the metal portion of the Smart Cover smartly smacked the iPad 2 display giving me a good start. I thought I’d look down and see cracked or scratched glass, but so far luck has been with me and this hasn’t happened. Now I tend to attach it carefully to the iPad 2. It has only come off a few times and once I nearly dropped it and the iPad 2 — so I recommend that you be careful with it. It does come off easily in certain circumstances, but not that easily. You’ll get used to it pretty fast and fewer mistakes are likely to happen while you hand it and your iPad 2. The magnets also provide a little more of that Apple magic we are all getting used to seeing. If you close the cover your iPad 2 will automatically go to sleep. Lift the cover off of the iPad 2 and it wakes up. If you don’t like this feature you can adjust turn it off by launching the Settings app and changing this behavior. If you have a passcode lock you’ll be prompted to enter it when the iPad 2 wakes up — I liked that feature a lot. I imagine that third-party case vendors will take some of this magic and put it into their own case offerings later. Now the smart in Smart Cover comes from the three ribs I mentioned briefly above. You use these to peel the cover back. The cover flips back over itself to form a triangular base that perches the iPad 2 at an angle that is comfortable for typing on its virtual keyboard in landscape mode. If you flip the whole thing over the triangle forms a perfect stand for holding the iPad 2 upright so you can watch movies, etc. I think I’ve established that fact that the Smart Cover isn’t the catch-all protective case for your iPad 2 — it’s a cover or screen protector and nothing more outside of the magnets interaction between the Smart Cover and the iPad 2. However, it does have one other claim to fame — Apple claims that the microfiber lining “gently buffs off any screen smudges or fingerprints as you move. ” The cover did seem to keep the screen clean to some degree with the exception of three streaks that correspond with the covers ribs. These never seem to go away, but at least they are straight and symmetrical. 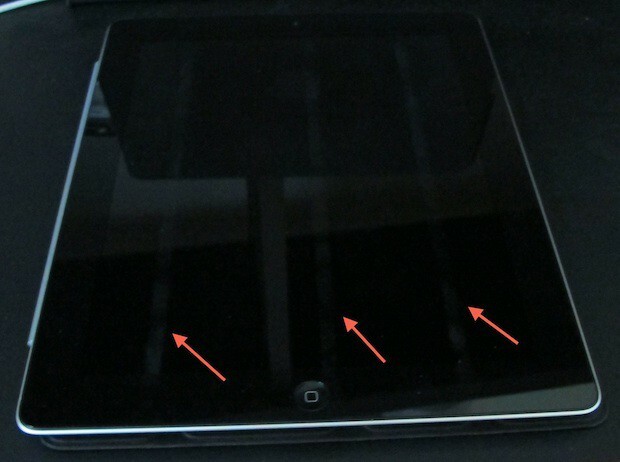 You can see them on my own iPad 2 in the picture below as indicated by the red arrows. The image was difficult to capture due to the reflective nature of the glass on the iPad 2 display. You may have to alter the angle from which you view this image to see the streaks, but they are easier to see in person. I decided to spend some time with my Smart Cover before writing this review. I think the Smart Cover is really interesting and not a bad idea at all. I think it is unique, innovative, and fun. It doesn’t look bad either. I just had to have black so my only option was to spend $69 for my Smart Cover. I’m not sure it was worth that much, but the Polyurethane color options weren’t professional. Finally, it does keep the screen clean, but not completely. I guess I’ll have to keep a micro-fiber cloth around or I’ll have to hope that Apple Store employees have a shammy handy when I drop by their store. If you need something light and airy that offers your iPad 2 minor protection and classy looks the Smart Cover is a fit for you. But if you are looking for something offering more protection or a real cover then keep looking.